The kids chose Contrast as the theme for half term week and I was immediately thinking to myself what a contrast it was that we were in half term already as it seemed only last week the kids were getting ready to go back to school after the summer holidays and of course our #summerphotofun. It got me thinking about all the contrasts that we have in our everyday world as we go about our lives and the fact that they are (for me anyway) everywhere. A small one relevant to this post is the contrast between what I might see in my eye and what appears on my screen when I attempt to photograph it. Occasionally this works the other way when something on the screen takes me by surprise but that’s rare compared to the other way around. What struck me looking at the photos that people sent in was how much contrast there is around us but that how beautiful it is. Beauty is not something that perhaps first springs to mind when you think of contrast as it perhaps goes better with compliment but some of these photos buck that notion for me: the simple red mug amongst a sea of white, the autumn colours, a carpet on a wood floor, new and old, stillness amongst activity. Look closely at these pictures and there is a real beauty to behold (perhaps apart from lettuce and gravy). I absolutely loved the photo of the person sat on the pavement reading a book, totally in a bubble while all around people are chatting and laughing. 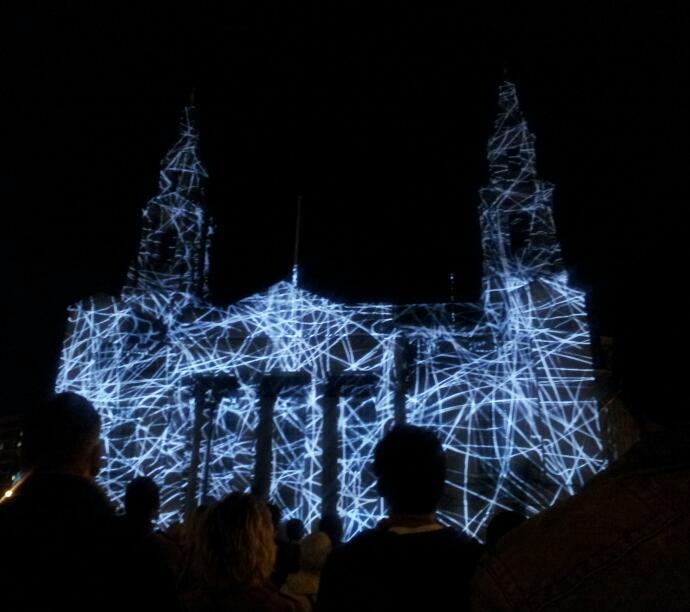 The photo at the top was taken by one of my kids on their phone at the recent Leeds Light Night and gives a pretty good example of contrast as the city hall is illuminated with stunning visual projections which stand out against the blackness of the night sky. Light Night is an amazing thing that happens each year in Leeds and is a perfect example of a good contrast when the whole of the city centre changes it’s normal Friday night characteristics and becomes a family friendly playground. Me and the kids have been doing our photofun themes during the various holidays for a couple of years now and really enjoy and it’s humbling that other people join in and make it such fun. Thanks to all of you who have taken part this time it’s really appreciated. We’ll probably do #DecemberPhotoFun over the 4 weeks so follow me @ianstreet67 on twitter if you don’t already to pick up the themes. We might throw in the odd random #weekendphotofun as well along the way. Click on the gallery below to open it and scroll through the photos in the correct size they came in.